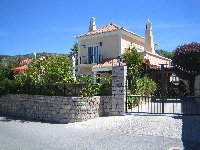 Welcome to our selection of holiday rentals in Loule. Loul� is an old town with its origins unclear but some say it dates back to Roman times, but because of its age it has a rich history and has seen many important events. Today, it is a large modern town but retains its history and personality. It is quite pleasant with many things to do and see with several shops, restaurants, public swimming pools, a sports pavilion and various art galleries. There is a market nearby the domed church on Saturday mornings and an Arabian style market hall that is open most mornings. Although quite large, the locations of interest to visitors are relatively close by each other; you are always a short walk away from something else you'll want to go to. Because of its history, there are several historical buildings and monuments to see. The grandest of which is of course the castle, which is a prominent feature in the town. The castle is mostly in ruins though; not by wars or invasion but by a natural earthquake in 1755. What remains are three outward projecting towers, one inward projecting gate tower plus the adjoining castle walls. These have been restored in the last century. The walls can be freely walked around by the public but the rooms in the castle cannot, however they can be looked into via glass doors. Although there isn't actually that much of the castle remaining, its still a nice enough attraction to the town and is worth visiting if you're in the area. Another attraction of Loul� is the carnival that last for three days, ending on Shrove Tuesday in February. It has been taking place annually for over 100 years now. It is the biggest event to happen to Loul� in the year with everyone dressing up in colourful costumes, playing music, dancing and partying. There are even parades and decorated floats. It is quite popular with the locals and sees many visitors from the rest of Algarve too. A calmer festival is that of the Sovereign Mother held during Easter and attracts people from all over Portugal. Looking for self catering holiday accommodation in Loule? Then below is a selection of holiday villas in Loule and holiday apartments in Loule that can be rented direct from their owners. You can either click on each listing for further details or you can use our search engine on the left if you are looking for something in particular.